• Seek and Patch Potential Threat thru’ Highly Specialize Vulnerability Assessment. • Provide Expertise in BCP (Business Continuity Planning). • Advise on the Best Market Practices on for Disaster Recovery. • Enhance Network Security with Professional Network Planning. • Maximize Data Survivability with Latest Backup and Storage Solution. 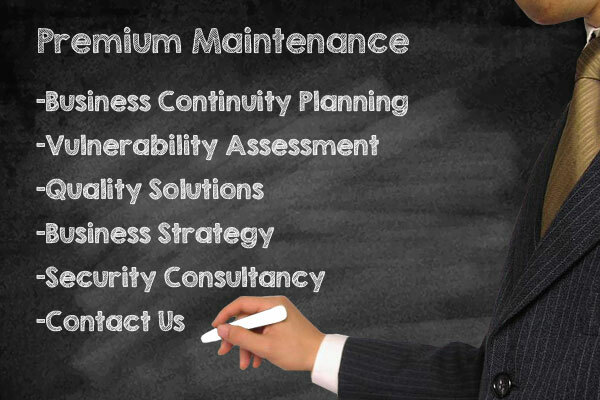 Premium Maintenance is an enhancement to standard maintenance package by integrating both Business Continuity Planning (BCP) and Vulnerability Assessment (VA). With Premium Maintenance Package, companies can enjoy a highly integrated maintenance that consists of Business Continuity Test and Vulnerability Assessment periodically. Together with periodical tests and reviews on test reports allow companies to have deeper understanding of their network infrastructure and protection of their IT investments. Nex Venture works very closely with clients to build their BCP, integrating it into their IT network infrastructure. Be it Man-made or Natural Disasters, Epidemics or Unforeseeable situations. Along with VA, plans are drawn to anticipate possible potential threats to ensure the highest security level for networks and in the shortest possible period of time.